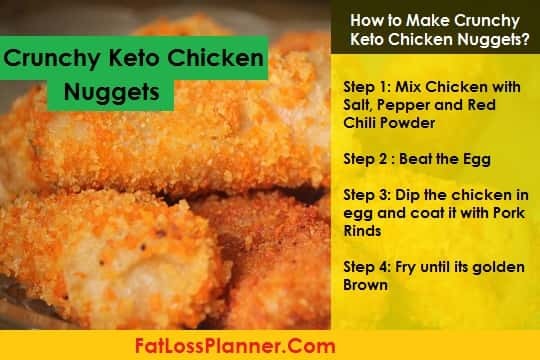 Is it possible to make Keto Chicken Nuggets at home that will help me to lose weight by enjoying the amazing taste and feeling of chicken nuggets? This is the question that keeps coming to my mind when at McDonald’s. Today I am here at McDonalds with my family enjoying a bit of junk. I being a vegetarian only have few options but my wife and family are really enjoying chicken nuggets and other stuff. Chicken nuggets really caught my attention and I being a health blogger started thinking about making a healthy version of it that will actually help to lose weight by keeping the taste buds happy. And guess what I am thinking of making a keto version of chicken nuggets. 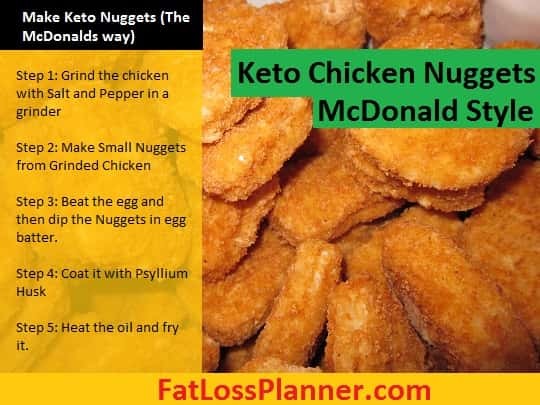 We know the chicken nuggets in McDonalds may not be super healthy but if we make it a Keto Way, it will really help you to drop your weight by igniting ketosis. It is like hitting two birds with one stone, meaning losing weight by enjoying the food you like. I mean isn’t it so amazing if we can enjoy chicken nuggets that actually helps to lose weight? 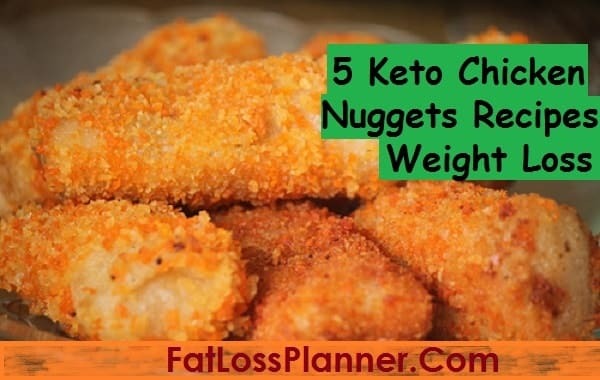 Here are the 5 different ways you can make Ketogenic Chicken Nuggets to lose weight and put yourself into ketosis. In this recipe you would need an Owen to roast/bake your chicken. This recipe is ideal for those who don’t like to consume too much oil. My wife specially doesn’t like to eat too oily food hence this recipe has been tried and tested by her, it worked out well and everyone in my family liked it. Let’s take a quick look at the ingredients needed to make this Keto version of chicken nuggets. 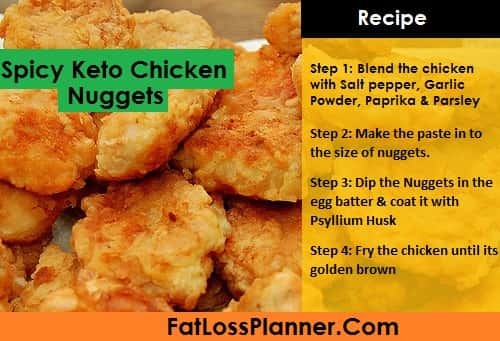 Once you have the above ingredients ready you can make your tasty Keto chicken nuggets in 6 easy steps. Step 1: Cut the chicken into pieces (Bite sized) and marinate it with Chili Powder, Paprika, Black pepper, Cayenne pepper and Granulated Garlic. Step 2: Mix the Psyllium husk with Almond flour. Step 3: Beat the egg and mix it with heavy cream post which dip the chicken in the egg, followed by coating it in Psyllium husk. Step 6: Serve it with green coconut chutney (Avoid Ketchups as it has sugar). You simply have to love this recipe as this recipe. This recipe will almost try to replicate the one that you may have tasted in McDonald’s. This may not be exactly the same as McDonald’s but this comes closest to it. Let’s take a quick look at the ingredients needed to make this tasty nuggets. How to make Keto Chicken nuggets the McDonald’s Way? Step 1: Put the chicken salt and pepper in the grinder and grind it until you have it in form of paste. Step 2: Make small nuggets from the grinded chicken. Your keto friendly chicken nuggets are ready. This recipe is not so common in India but this is something you can try. I am personally not a big fan of this recipe as I don’t like Pork rinds which does not go well with a lot of Indians. But if you like Pork rinds then this recipe is equally tasty. To make this keto friendly chicken nuggets you would need below ingredients. 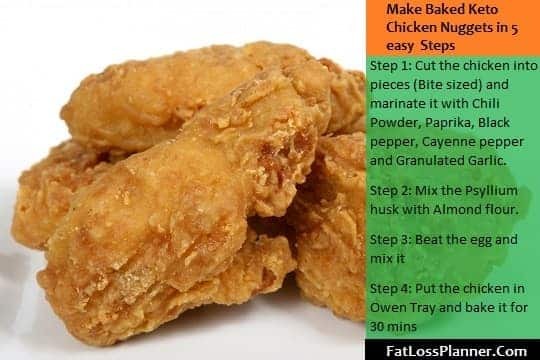 How to make crunchy Keto chicken nuggets? To make your keto nuggets crispy follow these 5 easy steps. Step 1: Mix the chicken with Chili Powder, salt and pepper. Step 3: Dip the chicken in the Egg and then coat it with Pork rind crumbs. Step 4: Heat the oil in a Pan and start putting the nuggets one by one. Your crunchy Keto Chicken nuggets are ready, serve it with green chutney and avoid tomato ketchup at all cost. Calories: Approx. 310 per 100 grams serving. If you are an Indian and a chicken lover, this is something you must try. This may not be as same as the one you have tried in McDonald’s but it has its own essence. To make this keto nuggets you would need below ingredients. 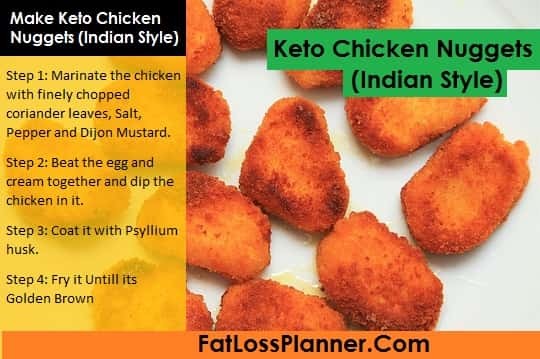 How to make Keto chicken nuggets the Indian way? Follow these easy to follow 5 simple steps to make your keto chicken nuggets. Step 1: Marinate the chicken with finely chopped coriander leaves, Salt, Pepper and Dijon Mustard. Step 2: Beat the egg and cream together and dip the chicken in it. Step 3: Coat it with Psyllium husk. Step 4: Put some oil in the pan until it’s good to fry the chicken. Step 5: Start putting the nuggets one by one and fry it until its golden brown. Serve this homemade Keto chicken nuggets with green chutney. I have saved best for the last. This is my wife’s favorite and everyone who has tasted this has absolutely loved it. This recipe is more suited for Indians who like spicy food. To make this taste buds pleasing dish you would need below ingredients. How to make spicy keto chicken nuggets? Here are the 5 steps to make your Spicy Keto Chicken Nuggets. Step 1: Put the chicken in the blender. Step 2: Add Salt, Pepper (Black and white), Garlic powder, Paprika Powder and Handful of parsley. Step 3: Blend it extremely fine, and make the paste in to the size of nuggets. Step 4: Dip the nuggets in the egg and coat it with Psyllium husk. Step 5: Heat the oil until it’s good enough to fry our chicken, Fry the chicken until its golden brown. Your keto friendly Spicy chicken nuggets are ready. Nutritional contents of Spicy Keto Chicken Nuggets. While all the recipes above are intended to trigger the ketosis, it won’t work if you eat any food items with chicken that has high Carb content. 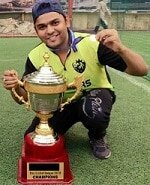 If you are serious on getting into shape with Keto Diet then I would recommend you see my 1 month Indian Keto Diet for weight loss. To sum it up out of 5 recipes mentioned above which one did you like the most, my personal favorite is the Fifth Recipe, which one is yours. Feel free to share your experiences below.